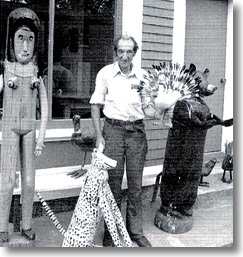 Born in Bridgewater, Nova Scotia in 1920, Wesley was considered by Chris Huntington, the “father” of Nova Scotia folk art, as one of his most talented discoveries and his work was often displayed at Chris' Wild Goose Chase Gallery in Blockhouse. Wesley participated in the first and second Nova Scotia folk art festivals. He was also featured in the National Film Board production, Folk Art Found Me, which was released after his death. When interviewed at the festival, for Folk Art Found Me, Wesley stated "some people, you know, want to make that kind of stuff and they can't get no shape of it at all, and some people, it just slips right off their hands like that. It must be born in you for to do it."